Iron Fist draws its influences from the strangest possible places. As a rule, the Marvel Netflix shows are heavily rooted in the reinvention of Marvel’s street level heroes that began around the turn of the millennium. There are generally two key creative figures associated with this era, artist-turned-editor Joe Quesada and writer Brian Michael Bendis. Working the bunch of street-level properties, these two figures invented and reinvented a number of characters and concepts that would become a cornerstone of this shared television universe. Sometimes the influence was rather direct. Jessica Jones draws fairly heavily and literally from Brian Michael Bendis and Michael Gaydos’ twenty-eight issue run on Alias. Sometimes that influence was more conceptual. Luke Cage tells its own unique story, but it is heavily influenced by Brian Michael Bendis’ rehabilitation of the title character during his runs on Alias and New Avengers. In some ways, Daredevil is an outlier, drawing on the iconic eighties run by Frank Miller, but it is still heavily influenced by millennial runs by Brian Bendis and Ed Brubaker. More like bored room, am I right? With all of this in mind, it seems like Iron Fist should not have to look very hard for an influence. The Immortal Iron Fist was a comic that reinvented a long-forgotten character in a way that made him accessible to modern audiences that had never latched on to Danny Rand. More than that, by focusing on the history and legacy of the title, Fraction and Brubaker had found (some small way) to defuse the potential racial controversy simmering beneath the production. Emphasising the tradition of K’un Lun, The Immortal Iron Fist diversified the mythos. And yet, in spite of all of that, Iron Fist chooses to draw most heavily and most overtly from the original appearances of Danny Rand in Marvel Premiere and Iron Fist, a run largely forgotten by history and notable primarily as a stepping stone to much greater things. Little references from The Immortal Iron Fist do slip into the series. Madame Gao seems likely to have been influenced by the character of Crane Mother. Danny makes references to “the Order of the Crane Mother” in Shadow Hawk Takes Flight. There are repeated references to the legacy of the Iron Fist, with Gao claiming to have met several of his predecessors in Felling Tree with Roots. A version of the Bride of Nine Spiders appears in Immortal Emerges from Cave, although she looks like she emerged from the nineties version of The Flash. 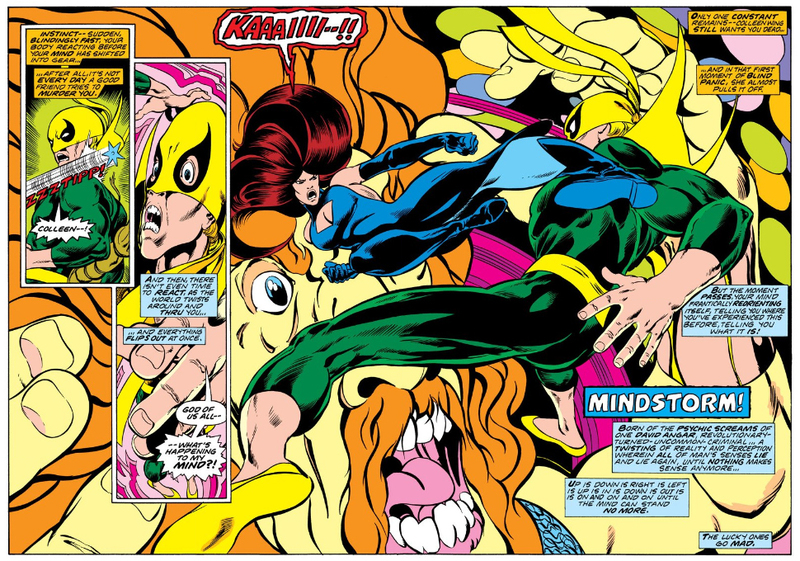 However, Iron Fist chooses to draw primarily from the original seventies version of the comics. This run began with the ten-issue run in Marvel Premiere that opened with writer Roy Thomas and artist Gil Kane, before cycling through a number of other creative teams and settling upon writer Chris Claremont and artist John Byrne. Claremont and Byrne then launched a fifteen-issue Iron Fist series that ran bimonthly and then monthly before being cancelled. They wrapped up their run in a two-part story in Marvel Team-Up. It’s a dojo, oh no, didn’t hear from me. Speaking generally, Marvel Studios take a great deal of care to ensure that their projects draw from the rich history of their intellectual property. Much more than Warner Brothers or Fox, Marvel Studios tend to take care to ensure that the lineage of their comic book properties can be traced clearly from page to screen. Given this emphasis on textual fidelity, it is highly unlikely that the company would ever have allowed major theatrical releases as eccentric as Tim Burton’s Batman and Batman Returns or The LEGO Batman Movie. Often, influences on particular film and television projects extend beyond generic concepts and down to specific stories or creators who worked on the characters. Sometimes those influences can be determined by the name of the project, with Captain America: Civil War drawing upon Mark Millar and Steve McNiven’s massive crossover arc and Captain America: The Winter Soldier rooted in Ed Brubaker and Steve Epting’s work on the two title characters. Sometimes the influence is subtler, as with Walt Simonson’s influence on Thor: The Dark World. So it makes sense that Iron Fist can trace its lineage back to the original comics. Most of the key players in Iron Fist can be traced back to that early run. Jeryn Hogath was created by Claremont and Byrne during their time on Iron Fist. The Meachum family originated during the Marvel Premiere run; Harold was created by Roy Thomas and Gil Kane, while Ward and Joy owe their existence to Doug Moench, Larry Hama. Although the Steel Serpent originated in an issue of Deadly Hands of Kung Fu, Davos was created by Claremont and Byrne. Iron Fist inherits more than just its characters from that early run. The thirteen-episode series’ fixation upon the corporate maneouvring at Rand Industries also feels like it was lifted directly from those comics. The comic books revealed that Harold was effectively responsible for the death of Danny’s parents, a detail that Iron Fist carries over (by way of the Hand in The Blessing of Many Fractures) in Dragon Plays with Fire. 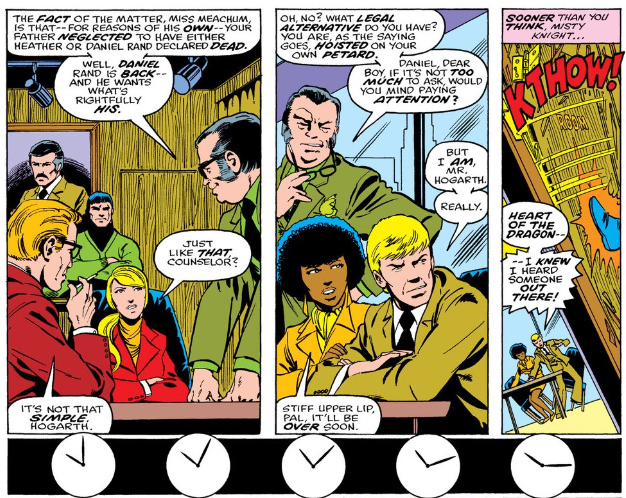 Similarly, Colleen Wing’s flirtation with the Hand in Black Tiger Steals Heart could be seen as a riff on her corruption in the Iron Fist run. There is a much stronger link between Iron Fist and those original comics than between Iron Fist and The Immortal Iron Fist. To a certain extent, this makes sense. Iron Fist is a show that will follow the path of least resistance when it comes to most things, seemingly existing to fill a single release slot before The Defenders arrives. As such, it makes sense to go back to the earliest issues, because it saves the production team the hassle of having to actually research the character and determine what works and what doesn’t. Textual fidelity, but without expending any effort. There is just one problem with all of this. Those original Iron Fist comics are quite simply not very good, and these aspects of the Iron Fist television series are the most soul-destroyingly banal. 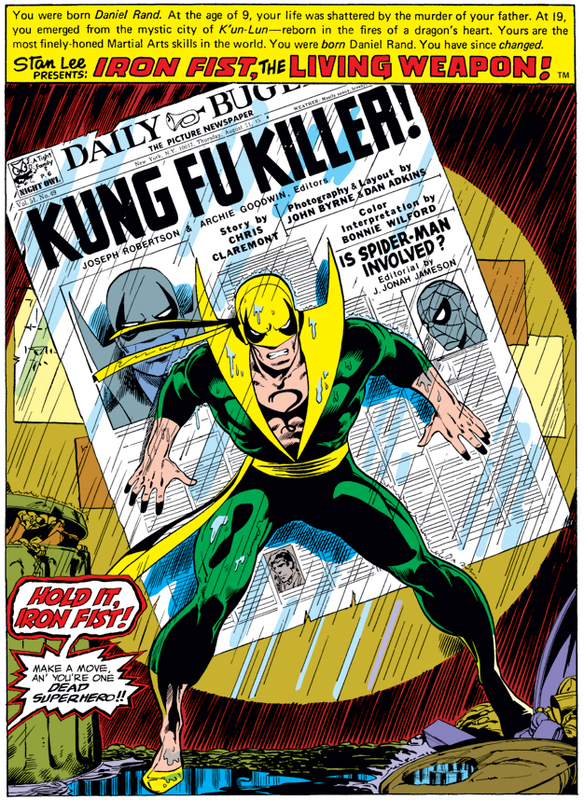 Those early issues of Iron Fist are something of a historical footnote, a curiousity in the history of the character overshadowed by later runs like Power Man and Iron Fist or The Immortal Iron Fist. 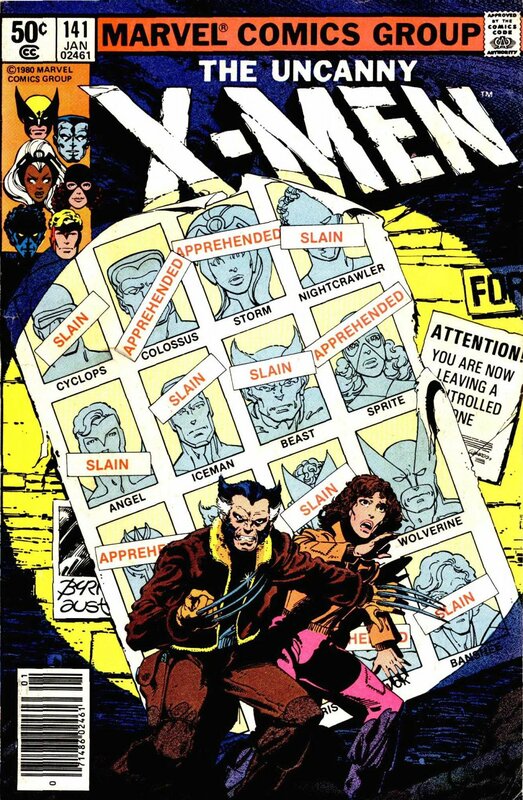 They are notable as an early collaboration between writer Chris Claremont and artist John Byrne, who would become two of the most influential figures in Marvel history. In fact, the best thing that can be said about those early Iron Fist comics is that they served as a springboard for Chris Claremont and John Byrne on to their massively influential run on Uncanny X-Men. While their work on Iron Fist is largely forgotten, their collaboration on Uncanny X-Men still shapes the industry to this day. 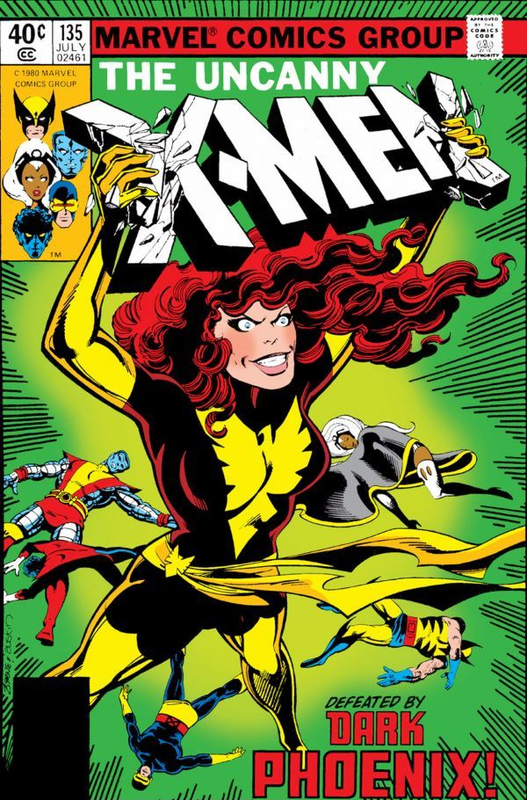 The Dark Phoenix Saga and Days of Future Past are probably the most influential X-Men stories ever told, and among the most iconic Marvel Comics ever published. They certainly left a sizeable mark on popular culture. The best thing that can be said about their work together on Iron Fist is that it feels like a dress rehearsal and warm-up for their later work on Uncanny X-Men. Readers will notice a number of interesting parallels, as if writer and artist are testing ideas before committing to them. Iconic X-Men images appear as rough drafts during the Iron Fist run. Iconic character arcs from the Uncanny X-Men run are rehearsed during the Iron Fist run. 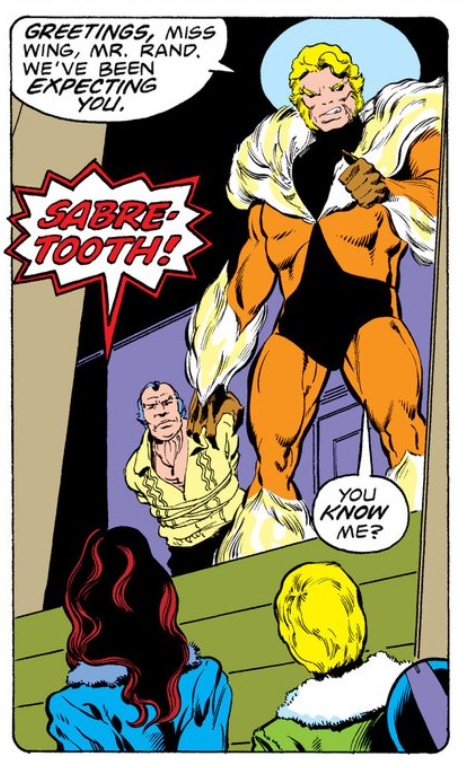 Claremont and Byrne not only introduced the X-Men character Sabretooth in Iron Fist, but also tease his connection to Wolverine. In other words, that original Marvel Premiere and Iron Fist run feels like something for completionists. It is notable primarily for what it led to, for both the character and the creative team. In some ways, that reflects the experience of watching Iron Fist. All too often, the show feels like a slog designed to lead into The Defenders. It seems to exist for no other purpose than the fact that somebody decided that Danny Rand should be on The Defenders and that he needs his own origin story. There is something frustratingly rote about all this. 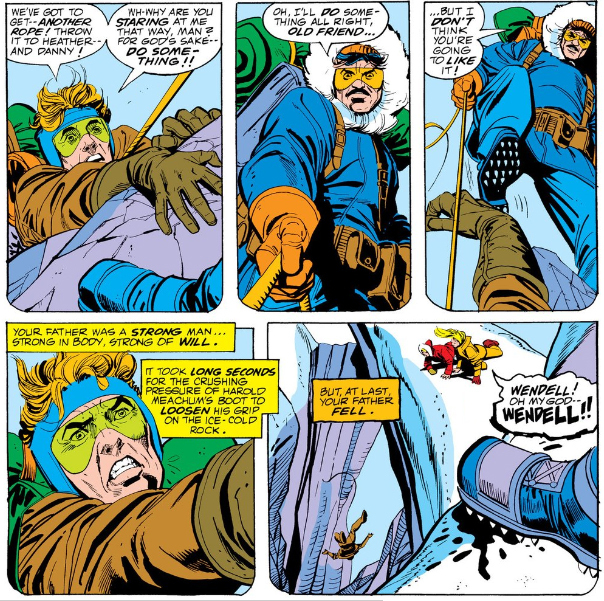 As with those seventies comics, there is a sense that the production team has no idea what makes Danny Rand unique and has no sense of an angle that will work with the character. To be fair to Claremont and Byrne, they were essentially creating the character from scratch and had nothing upon which they might draw. Iron Fist has over forty years of inspiration from which it might draw, let alone the capacity tell a story that is new or innovative. Choosing the earliest comics as their inspiration feels lazy. The difficulty here is that when you tell a superhero story, the natural impulse is to start at the beginning – with the origin. But superhero origin stories are essentially a different genre from regular superhero stories. Superhero tales are about extraordinary superbeings bashing each other with ridiculous powers. Origin stories are about ordinary people suffering some sort of transformative trauma. The first is exhilarating, fanciful – fantastic. The other tends to be a somber downer. Watching Warthog Boy blast aliens with his tusks is one thing; watching Gomer Grunt’s family trampled by irradiated wild pigs is another. Jack Kirby and Stan Lee knew which sort of story they wanted to tell in their first Fantastic Four adventure in 1961. The comic opens with all the heroes summoned by a Fantastic Four flare; you get to watch each of them power up, including a famous scene where The Thing bashes his way out of a sewer. Then there’s a quick origin in flashback before the comic gets down to an unrelated battle against the invading subterranean Mole Man. There’s no tedious wait for the superhero powers to show up. Instead the comic gets right down to business with Kirby drawing monsters busting through things, which is what he did best. It’s what his audience was paying to see. Many of the best superhero films and shows eschew origin stories. Luke Cage and Jessica Jones confined their origin stories to single episodes in the middle of their first seasons, Step in the Arena and AKA The Sandwich Saved Me. The Dark Knight avoids an origin for the Joker. The Incredibles focuses on life after superheroes. There is absolutely no need for Iron Fist to go back to the origin of Danny Rand and focus on those early stories. After all, the Marvel Cinematic Universe has existed for almost a decade at this point. Unlike the comic books, it would seem to be moving in something approaching real-time, due to the seasons of television shows and the ageing of characters and actors. It is entirely possible to believe that Danny Rand could have been out in the world for an extended period of time. There is no need to build a story around him becoming a superhero. Who watches a kung fu show for extended scenes of characters in board rooms making passive aggressive jibes at one another, fighting over a billion-dollar company with very vague business interests using high-priced lawyers? Anybody giving the matter any thought would appreciate that the corporate shenanigans that run through the first season of Iron Fist are the last thing that anybody watching the show would actually, positively want. So why are they there, beyond the laziness of assuming the early Iron Fist show should draw from the early Iron Fist comics? To a certain extent, it feels like the concept of “the canon” is to blame. Increasingly with geek properties, and particularly with the Marvel Cinematic Universe, there is a tendency to treat the source material as sacred and inviolable. This impulse is understandable, at least on a surface level. After all, what is the point of adapting a popular concept or character if the adaptation will no acknowledge or draw from popular source material? Why make an Iron Fist series, if it is not going to look like the Iron Fist comics? However, in practical terms, adapting and updating this material is a process of translating. The comic books were often a process of trial and error, written on the fly without an eye to the larger picture and without all the knowledge and awareness that evolves over time. When it comes to stuff that didn’t work on the comic page, why not take the opportunity to fix it in the adaptation? When it comes to what worked on the comic page in the seventies, why not understand that the art of adaptation involves translating it for the screen in the twenty-first century? In some respects, many of the truly great comic book adaptations understand this. The current model of textual fidelity would never allow for anything as weird as Tim Burton’s Batman Returns, and the world is the poorer for it. More than that, it is telling that the truly innovative and compelling Marvel adaptations are happening over at Fox, with James Mangold’s work on Logan and Noah Hawley’s Legion. They both bend and distort canon to serve their purposes, using these concepts and elements to tell their own story. The elevation of corporatized canon to scripture in geek culture is a particular issue. Snyder’s appeal to “true canon” isn’t just one seen in comment threads and message boards. When Snyder or Abrams speak about canon, they speak with the weight of Warner Brothers and Disney behind them. Their canon is a fully top-down policy, one that empowers fans as enforcers and sells an endless array of branded special knowledge. The canon is true, and cannot be questioned. Its themes cannot be wrestled with. It cannot be criticized. It must be consumed in its entirety or not at all. And if official canon chokes out casual engagement and deep engagement with stories alike, then it’s best to simply throw it away. What’s been largely lost over the past decade is the crucial point that these stories are imaginary—they were dreamed up by people, and can be changed, distilled, or subverted by anybody at the drop of a hat. There is no true canonical version of Batman, Superman, Princess Leia, James Kirk, or any other shared characters—only infinite interpretations by an array of creators. Treating them as if they’re carved in stone only reduces them to a flat series of issue numbers, paragraph citations, or official tables. It takes away the joy of personally deciding which version of a character you like, which version of a story you prefer. The truth is that nobody—not the company, not the fans, not even the creator—can dictate the nature of a story to you. Batman v Superman is not canon. Neither is Batman: The Dark Knight Returns, or the current Batman run, or the Star Wars novels, or even the films. The only true canon is personal, and it lives inside your head. This might seem like a trivial point, but it has far-reaching repercussions. After all, the issue of canon even bleeds over into the discussion about the racial politics of Iron Fist. It becomes a convenient first line of defence. The fact that Danny Rand was white in those early Marvel Premiere issues renders any criticism of the show invalid. The board room battles that dominate so much of Iron Fist might be rooted in the comics, but that doesn’t mean that they should have been the focal point of the first season. And they are a driving force of the first season as a whole, to the point that it’s surprising Danny Rand isn’t filling out legal forms while drop-kicking bad guys just to make his day more efficient. Control of Rand Industries changes no fewer than four times over the course of the thirteen-episode season, and none of it makes for particularly compelling viewing. Rolling Thunder Cannon Punch comes in the middle of the first transition, as Danny fights tooth-and-nail to retake control of his father’s company. That battle will come to an end in Eight Diagram Dragon Palm, when Harold Meachum just cedes control to Danny. However, Danny’s conscience leads to a series of entirely predictable screw-ups, which leads the board to jettison Ward and Joy in The Blessing of Many Fractures, but Harold resets the balance in Black Tiger Steals Heart. Harold then moves against Danny in Dragon Plays With Fire. These are all transparent examples of Iron Fist stalling for time, trying to give supporting characters something to do while stretching out to thirteen episodes. There are plenty of other similar storytelling dead ends, from Ward Meachum’s flirtation with super-strength heroin between Immortal Emerges from Cave and Bar the Big Boss to the awkward half-hearted attempt to suggest the Hand might not be an undead ninja cult in Black Tiger Steals Heart. Again, the show’s laziness bleeds through, a desperate need to keep the wheels spinning as the show ticks along. To be fair, there is the possibility of saying something interesting about corporate power in contemporary America. Indeed, there are any number of parallels that might be made between Harold Meachum and Donald Trump, from the sheer volume of nonsense that he spouts to his reliance on external forces to secure his power to his slightly creepy relationship to his daughter in episodes like Lead Horse Back to Stable. There is certainly room for a superhero story about managing a large multinational corporation in the contemporary day-and-age. Iron Fist makes only the most superficial gestures towards these questions, scribbling corporate criticism in crayons on the walls as Danny deals with the company that his father built. In Eight Diagram Dragon Palm, Danny has the crazy idea that maybe pharmaceutical companies charge unreasonable rates for life-saving drugs. In Felling Tree with Roots, Danny wonders whether it’s possible to follow environmental regulations and still be immoral. In Black Tiger Steals Heart, Bakuto offers stock pseudo-Marxist criticisms of big business. Then again, the intentional vagueness of these criticisms and the black-and-white nature of these situations arguably reflects the show’s politics. In the second half of the season, the Hand are reconceived as a very shallow and superficial pastiche of certain leftist movements with young memberships, playing like a parody of Black Lives Matter or Bernie or Bust as imagined by a Fox News pundit. With that upcoming pivot in mind, the show’s very limited and soft engagement of corporate America makes a great deal of sense. I know kung fu, fu! As such, all of this is kept vague and ambiguous, without any real specificity or nuance. There is never a sense of the sorts of compromises that Danny would have to make operating in this world or how better the serve people rather than profit. Indeed, Iron Fist is decidedly ambiguous about what exactly Rand Industries does. It certainly manufactures pharmaceutical drugs, but it also seems to be involved in logistics and transportation. For all the time that Iron Fist spends on Rand Industries, the location and its workings are decidedly shallow. Instead, all the characters speak in vague terms about what the company actually does and why it does it. “He always wanted Rand to be something good in the world,” Jeri tells Danny about his father’s relationship to the company. However, there’s never any real sense of what exactly that means. Did Danny’s father want to run Rand Industries as a non-profit? Did you object to certain pharmaceutical contracts? Did he have a statement of international ethics? What exactly does any of this mean, and how have the Meachum’s perverted that? This creates a massive tonal dissonance with the character of Danny Rand. The early part of the season focuses on Danny trying to reclaim control of his company. However, Iron Fist never quite explains why this is a character arc that should endear audiences to the character. He wants control of Rand Industries, but what exactly does he want to do with it it? Is the audience supposed to believe that Danny has the practical experience to turn it into “something good”? Given that he seems to trust Joy, can the audience even be sure that the Meachums are perverting it? Iron Fist never explains why Danny Rand would want his company, beyond the fact that his name is on it and he is entitled to it. That is a fine legal argument for ownership, but it is hardly instructive from a character perspective or compelling from the audience’s viewpoint. In Batman Begins, Bruce had a very clear reason for wanting to retake Wayne Enterprises from the current board. Not only were they perverting his father’s company and vision, but they were also enabling the moral decay of Gotham as a whole. Of course, the question of material need for the dojo is somewhat muddled. Early episodes like Snow Gives Way suggest that Colleen is struggling to keep the business afloat. It is suggested that Colleen’s cage match in Rolling Thunder Cannon Punch is justified by her need for money as much as it indulges her repressed thirst for violence. However, in Under Leaf Pluck Lotus, Danny buys the building to protect the dojo. However, the reveal in Black Tiger Steals Heart that the Hand have been running the dojo as a recruitment centre throws all of this into doubt. While this rejection of material need in favour of principle is an interesting thematic point, it ultimately rings hollow. After all, it’s not as though Danny’s desire to take control of his father’s company would require him to abandon material need. “You are worth billions, Danny,” Jeri tells him. “Not millions.” Indeed, the decision to pursue his rightful ownership of the company is portrayed as more materially beneficial than accepting the one hundred million dollar pay off would be. None of this serves to make Danny any more engaging as a character. To most audience members, the difference between hundreds of millions of dollars and billions of dollars is purely academic, and it is hard to emotionally invest in the heroism of a character who so immediately commits to the fight to claim billions of dollars over one hundred million dollars. It really feels like a superhero should be doing something more superheroic than fighting for a couple of extra zeroes on his net worth. In some ways, this explains why the muddled Meachum family psychodrama is far more interesting than anything happening with Danny. Iron Fist never seems entire sure what it is doing with any of the Meachum family, but their dynamic is much more relatable than anything involving Danny Rand. None of the characters in Iron Fist feel like real people, but the interactions between Harold Meachum and his children are at least rooted in something that most audience members can understand. The son also… sits there. There are some interesting themes here about the difference between love and control, which play out in some of the other plots. Harold’s manipulation of his children is echoed in Bakuto’s manipulation of Colleen, although Bakuto seems at least more honest about his blatant cynicism. Similarly, Harold’s desire to reduce his children’s agency mirrors those recurring conversations about the self-determination that is taken from those employed as tools or weapons. Is Lei Kung any less abusive towards Danny in Immortal Emerges from Cave than Harold is of Ward? Of course, Iron Fist never invests enough energy in the rest of the cast to make these dynamics work. Outside of his appearance as a hallucination in Immortal Emerges from Cave, Lei Kung only appears in dialogue given by other characters. Similarly, Bakuto falls somewhere between Gao and Nobu on the “Hand leader blandness” scale. As a result, these larger themes never really take root outside the Meachum family dynamic. It helps that Tom Pelphrey is game for whatever the show throws at him, and David Wenham is easily the best actor in the cast. Nothing involving Danny ever resonates as effectively as these ridiculously toxic Meachum family dynamics. Still, this battle is revealing of the Danny’s central flaws, albeit flaws which Iron Fist can never bring itself to acknowledge. Danny’s primary motivation throughout Iron Fist is never the greater good or the protection of mankind. Instead, Danny is consciously motivated by his own sense of entitlement. Danny always knows best, even when he is completely out of his element. Danny always gets what he wants, even when he has no idea what to do with it. “You can’t deny what’s mine,” Danny warns Ward and Joy. “What my father wanted me to have.” That seems to be the motivation for his aggressive pursuit of the company. He warns them, “It’s my name. It means something.” Danny might not know what it means, but it belongs to him. Danny might not know why his father wanted him to have it, but he still wants it. This is certainly an interesting central character trait for a story so awkwardly mired in the politics of cultural appropriation. Indeed, later episodes like Lead Horse Back to Stable and Bar the Big Boss make an argument that Danny adopted a similar approach to the position of Iron Fist of K’un Lun. Danny did not want the responsibility or the obligations that came with the position. Instead, Danny seems to have become the Iron Fist simply because he wanted the prestige. He abandoned his post at the first opportunity, forsaking a people who had entrusted him with the protection of their city. This development is foreshadowed as early as Danny’s conversation with Joy in Eight Diagram Dragon Palm. “When I got to the monastery, post-crash, I learned of a certain… position… a powerful, important job,” he tells her. “And I wanted it.” He elaborates, “So, problem was… I never thought through why I wanted this job. I mistook my stubborn will for a sense of destiny or something. I never counted the cost of what it would actually mean to my life.” There is a real sense that Danny did no want to be Iron Fist so much as he wanted legitimacy. This early characterisation of Danny Rand sets a very clear (and very frustrating) character arc. The clear direction for Danny’s character development is to take responsibility for his own life choices, to return to K’un Lun to fill the position of Iron Fist and accept that he made a conscious to sacrifice his own comfort and desire for the greater good. This is the obvious arc of the hero’s journey across the first season, with Danny learning to put the needs of others ahead of his own selfish desires. Making money, Hand over Fist. In theory, there is an interesting arc set up. Unfortunately, Iron Fist lacks the necessary self-awareness to follow this story in its logic direction. When Davos calls Danny out for his cultural appropriation in Lead Horse Back to Stable and Bar the Big Boss, the series suggests that Davos is being unreasonable. In fact, Iron Fist ultimately parallels the journey of Danny with the journey of Ward, suggesting that Ward’s rejection of his abusive power is comparable to Danny’s rejection of K’un Lun. Danny’s decision to return to New York is portrayed as an expression of his independence and freedom, rather than a selfish violation of a sworn oath. It is entirely possible that The Defenders will build upon the cliffhanger ending of Dragon Plays With Fire, and acknowledge that Danny’s selfishness and arrogance have endangered an entire city of people who entrusted him with their lives. However, there is a sense that this character arc does not justify twenty-one episodes of screen time. Iron Fist fails to allow Danny to develop, instead letting him wallow. To be fair, there are practical reasons why Iron Fist might shy away from the hero’s arc that ends with Danny accepting the responsibility of the Iron Fist, tied to the continuity demands of the Marvel Cinematic Universe. Danny’s arc cannot end with him leaving the world, because he exists as part of a larger storytelling framework. Danny returning to K’un Lun would end his story, and remove him from play for future series of Iron Fist or future crossovers. There are practical demands within the shared universe, ones that override the story being told. Perhaps this explains why Iron Fist is so reluctant to call Danny out on his selfish entitlement. The shared universe demands that Danny be an active part of the New York superhero scene and that Finn Jones keep appearing in these series, so the arc of the series distorts around that fact. Iron Fist cannot follow the character’s logical arc to its conclusion, because that would interfere with plans for the superhero that extend beyond the reach of the current production team. It is perhaps another example of how the “canon” and “continuity” can smother creativity. With all of this in mind, Iron Fist plays like a conventional superhero origin that somehow completely misunderstands its hero’s journey. There is something remarkable about how generic Iron Fist can feel, hitting any number of stock superhero storytelling beats while completely missing the point. Iron Fist follows the path of least resistance in all things, but it never leads to anywhere satisfying.